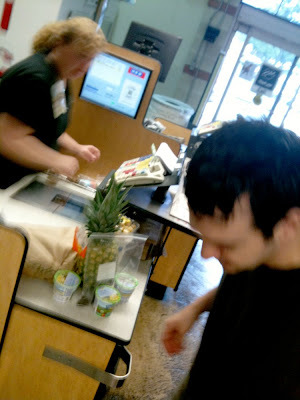 My son and I went to Central Market to get some food for breakfast. It was Saturday morning so we got lots of free samples. We weren't very hungry by the time we were through shopping. 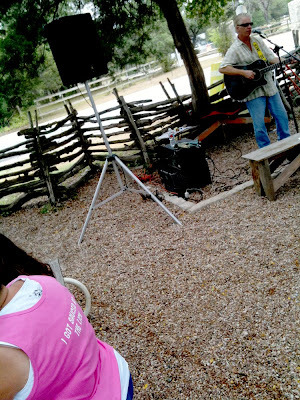 Then we went to Saltlick for lunch. 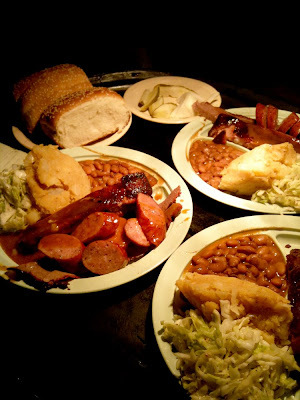 I was really anxious to have great bbq. But now I'm not sure. Maybe I'll become a vegetarian again. Oh... here's the food. Between the slaughtering of pigs and cows, and the fat and sugar that is causing so much pain and sickness we have something that looks darn good, especially before you eat it. 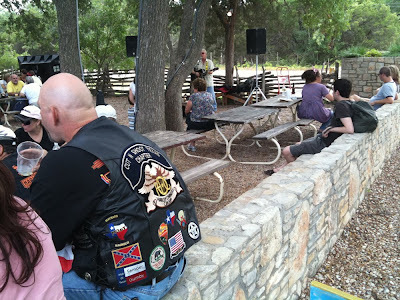 Here's a guy at SaltLick from the "CutnShoot" motorcycle club. I don't know who they cut and shoot. My son Josh is also sitting on the stone fence. 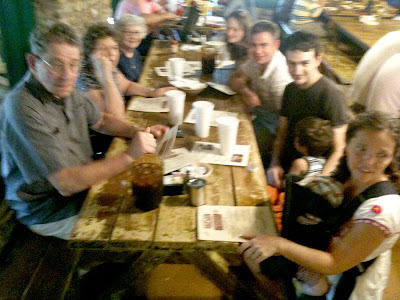 Here's the gang at SaltLick, ready to order. Our waiter had a sign on his lapel that said "last day to wait on tables." I asked what was next for him, and he said that tomorrow he starts a PhD program in nanotechnology. Group pics are hard... always some people look terrible. Low light pics are terrible. The combination makes an Ensor crowd scene. So this was the dinner. 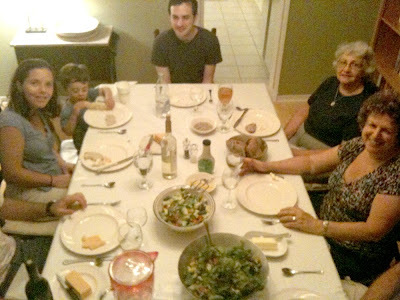 Only salad, bread, cheese, ice cream, (and wine). I couldn't get everyone in the picture. Should have brought in the 8' ladder. "But now I'm not sure. Maybe I'll become a vegetarian again." You sure are fickle. Sharpness is overrated for family pictures. You need to get the new super wideangle iphone. H.